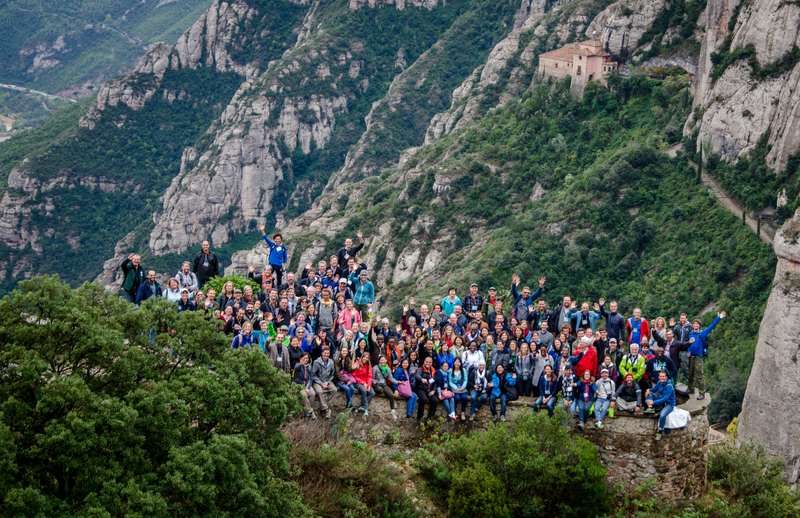 A total of 136 participants representing 39 institutions across 35 different countries enjoy a field trip hosted by Fundació Catalunya-La Pedrera at Montserrat Natural Park and Cultural Heritage Site, Barcelona, Spain at the CCNet Rally 2015. Photo © Felix Cybulla. We held our sixth CCNet Rally from September 29 to October 1, 2015 at Món Sant Benet, Barcelona, Spain. With input from our coaches and thanks to a hard-working, enthusiastic planning team, we designed a program that included diverse activities, such as plenary events; workshops to hone existing and new skills; working group sessions for sharing approaches, exploring specific problems, and developing products; and unstructured time to foster networking. 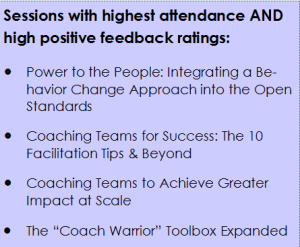 What makes our rallies unique is that each session is hosted by experienced coaches from around the world who join forces to prepare relevant and engaging sessions. Coaches often bridge organizational, geographic, cultural, linguistic, and time-zone boundaries for months before they actually meet in person at a rally! This spirit of “learn it and pass it on” is the heart of our network. Together, we were able to offer 21 different sessions, covering themes such as: adapting and evolving how we use Open Standards in a changing world; going to scale with the OS; improving our planning; closing the cycle and supporting the latter portions of the OS; and strengthening our practice of coaching. Following up on a recommendation from our recent external evaluation, we invited Dr. Meredith Niles (Assistant Professor in the Department of Nutrition and Food Sciences at the University of Vermont) to help our group learn more about behavioral sciences. You can read more about her eye-opening talk and how we can apply it to the OS in our January 2016 edition of the CCNet News. To celebrate our community’s 10th anniversary we shared what we have accomplished and received feedback regarding where we can go. Our colleagues from CCNet Australia shared an inspiring talk on what has been accomplished in Australia to impact conservation at scale while also empowering local communities. In addition to the networking that began as we prepared for our big community event and the field trip to the breathtakingly beautiful Montserrat Natural Park, the Tools and Innovations Market offered an informal and fun space for colleagues to meet, share their passions, and learn about tools, methods, and ideas. Our group filled the quiet medieval Benedictine monastery where our Rally took place with a joyful multi-lingual buzz, as 136 participants from government agencies, indigenous land management agencies, foundations, non-profits, academic institutions, and several independent consultants mingled to learn, connect, and celebrate. In total we represented 35 countries and 39 different institutions across all six continents. 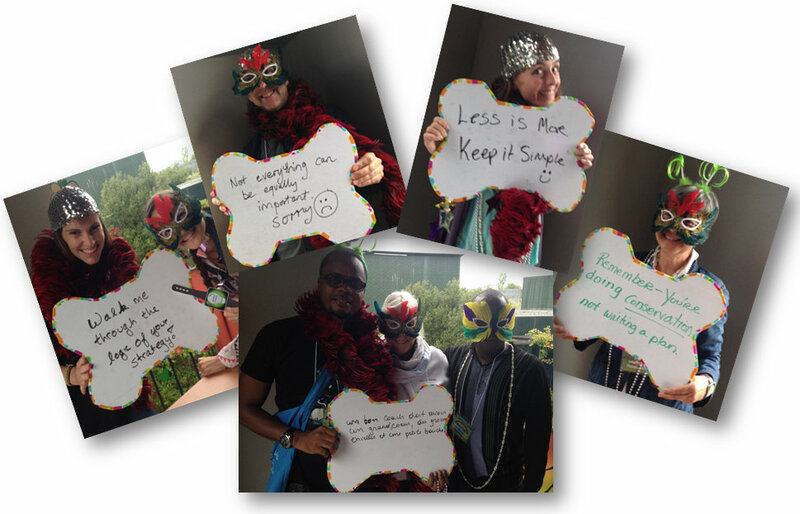 Coaches shared tips and lessons at the Bones of Wisdom photo booth. One bone of wisdom reminds us that “a good coach needs a big heart, big ears and a small mouth”. Photo © Barry Heydenrych and Nina Hadley. The Core Rally Planning Team continued its tradition of walking the talk by setting objectives for the Rally, defining indicators to assess how successful we were in achieving those objectives, and monitoring those indicators by providing attendees the opportunity to evaluate workshops, plenaries, and other aspects of the Rally. The mobile Guidebook app helped us reduce paper use and time spent in data entry. 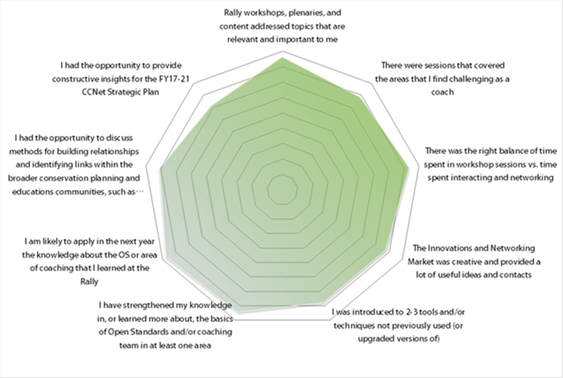 We are still compiling data to see how well the Rally met the Core Team’s objectives and attendees’ expectations, but in the box on the side you can see which sessions were really popular and below is a radar chart with some of the results from the Overall Rally Evaluation. Thanks to everyone who took the time during the Rally to provide feedback – we use this information to make the Rally better each year.Though we are still uploading content, we invite you to visit the CCNet Rally 2015 website. Thanks to everyone who served on the Rally Planning Team and to all of you who contributed by actively engaging in sharing and learning! Special thanks to our sponsors and friends who made our sixth community garthering possible: Albertien Perdok; Anonymous; Conservation Measures Partnership; Foundations of Success; Fundació Catalunya-La Pedrera; Fundación Biodiversidad, Ministerio de Agricultura, Alimentación y Medio Ambiente del Gobierno de España; Greening Australia; The Nature Conservancy; WWF-CH; WWF-España; and WWF-International, Conservation Strategy and Performance Unit.